British motorists love open top cars to a greater degree than their compatriots living in more temperate climates. Perhaps they are not the ruddy-faced die-hards of a long gone era, more likely the smart set that prefer boutique shopping even if that breath of fresh air interferes with an expensive hair style. Of course, there are some pretty exotic open-top cars to be had though the big market is for the more compact cabriolet models, mainly soft top but with some metal roof contenders for those who insist on the ultimate. 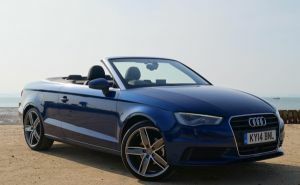 Audi has kept to the soft top strategy for the just launched third generation version of the A3 Cabriolet that proved to be one of the most user friendly offers currently on the market. Enjoying this one proved possible without being excessively windswept. The real advance is on the mechanism for the soft top that Audi claim can complete opening or shutting in 18 seconds – that would pass the self-termed ‘traffic light’ test of a Canadian motoring journalist who insisted that one should be able to operate the soft top while waiting at a traffic light. Audi totally destroys that argument with this model that allows the driver a one touch of a button operation of the roof at speeds around the 31 mph mark. In creating what I am sure will be a really big seller, Audi has employed the basis of the saloon of the A3 rather than the hatch back or Sportback versions. This strategy, in my opinion, ensures a rigid structure with of about passable space for the rear seat occupants unless they are really lanky and a luggage capacity of 320 litres that is probably on par with a two-seat sports car from a previous era. That said, at least there is the facility to split fold the rear seats, thus creating a practical load advantage over a two-seat sports car, the potential maximum space raising to 678 litres. When Audi launches a new model it is a sure bet that a great deal of development has been undertaken, this includes complete concealment of the soft top (with little loss of luggage space when folded, a worthwhile weight saving of around 50 kilograms and, apart from height, slightly increased body dimensions. As with some other recently introduced Audi models, there is a no-cost suspension option that allows the customer to select a sporting driving character or a more comfort-orientated standard suspension. Certainly the ride and handling provided by the ContiSport Contact medium profile tyres proved positively satisfying. At launch the new model will be offered with three advanced engine options – 1.4 and 1.8 TFSI petrol turbo units, the smaller one featuring Cylinder on Demand technology that cuts out two cylinders when under part load, the larger one a dual fuel injection to achieve some impressive performance. According to Audi the economy champion of the trio is the 2.0 TDI turbo diesel (as tested) developing 148 bhp with a reported combined Economy figure of 67.3 mpg and pretty clean emissions of 110 g/km. Claimed top speed is 139 mph with the 0 to 62 mph (100 kph) sprint from rest taking a commendable 8.9 seconds. On the road it proved an immensely flexible yet quiet power unit, delivering a very satisfying performance through a positive and light acting 6-speed manual gearbox – a 7-speed DSG selectable automatic transmission is also offered on the 178 bhp 1.8 TFSI version. A great drive, achieved selfishly with the roof down for the most part when it actually proved quieter than I expected, while with roof up, one could be travelling in a fixed head car. at would not be out of place in a sculpture gallery and the flat bottomed, multi-functional leather-clad steering wheel might look unusual but in use feels comfortable, Instrumentation is based on two generously sized circular dials with black faces and white figuring – a retro touch from the original rally-winning Quattro model. Driver vision is great with the roof down, some rear three quarter blind spots with the roof up though countered by the cost-extra audio rear parking system, Rear window is a heated glass object. Build quality and finish is to the very high standard that is Audi’s bench mark, general equipment is a good package and, as usual augmented by a long menu of options to create that bespoke car. My overall impression is that Audi, with this A3 Cabriolet has moved up a notch from the desirable predecessors to what is an obvious icon. Got to admit I didn’t want to get out of this one! MAIN RIVALS: BMW 3 Series Cabriolet, Vauxhall Cressida, VW Golf Cabriolet, VW Beetle Cabriolet. A brief drive of BMW’s new i3 electric powered five-door hatch back proved that our motoring way of life is starting to produce some sensible options to the conventional motor car. Constructed using some newly developed light-weight materials this compact yet roomy car (boot space is surprisingly generous) has a creditable turn of performance, both around town and at motorway paces. The plug-in chargeable power unit can also be specified with a cost-extra petrol engined range extender. What is a clever touch is wiring in the brake lights to operate when the throttle is lifted and the car is slowing as the energy harvesting system creates a braking effect. Equipment is to BMW’s usual executive standard and cabin trim is traditional BMW. Options included a £790 Park assist package that includes a reversing camera and a park distance control. Transmission is fully automatic. One has to work out if this type of motoring suits your need, my local GP (a serious car buff) has bought the first one from his local dealer and I can understand why. He lives about half a mile from the surgery but requires transport if he has to go out to a local home visits, potentially a lot of short but necessary journeys. Performance factors include a carbon footprint of a mere 13 Co2 and 470.8 mpg on the combined cycle. Cost of the car as tested came to £42,115 though there is a £5,000 Government grant. The doctor’s wife has the conventionally powered car for general journey use – in essence the main car user in the family now has the second car!